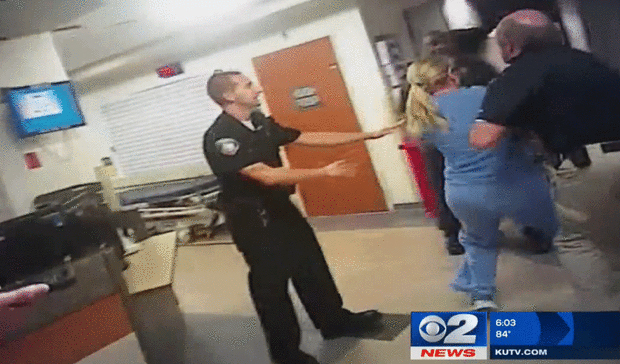 A Utah police officer was fired Tuesday after being seen on video roughly handcuffing a nurse because she refused to allow a blood draw in an incident that became a flashpoint in the national conversation about use of force. “You demonstrated extremely poor professional judgment (especially for an officer with 27 years of experience), which calls into question your ability to effectively serve the public and the department,” Brown wrote. Attorney Greg Skordas, who represents Payne, has said his client served the department well for nearly three decades and questioned whether his behavior warranted termination. Skordas couldn’t immediately be reached for comment Tuesday. Even in this small dept. Of what 450. It shows. The law and request of a official can and will be ignored. Even after his was ordered. Chief Brown. Needs to leave. Good riddance and every officer that was directly involved should have been punished. The law was clear and the officer arrested the nurse for “contempt of COP”. She failed to follow unlawful orders and was arrested on a trumped charges. Finally a bit of justice for the public.